Disclaimer: I personally have never played Warhammer Fantasy Battles. So please don't think I'm not sympathising with the WHFB players and I understand that many people are upset that the original game and setting are gone. I would be upset too if I had invested so much in the old WHFB. I'm not here to stop the haters from hatin'. If you're done with big ol' Geedubz, by all means leave. Still, this is just my (hopefully rational) opinion and my excuse to finally paint some Lizardmen! 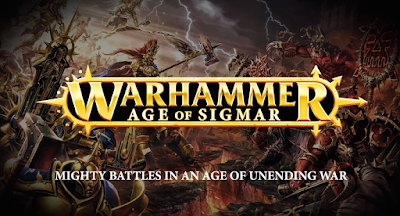 Remember when I said I would hold off my Lizardmen army till the new edition of Warhammer Fantasy dropped and remember when I said I'll be holding off my Lizardmen because of the Skitarii... yeah and then Age of Sigmar happend.
" The Warhammer Age of Sigmar rules provide a framework for you to bring your miniatures to life, and command them in battle on the tabletop." So, from what I make of that is that we, as the community of creative, self thinking gamers, are free to play it to our liking. Lazy game design by GW? Perhaps. 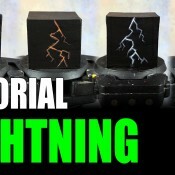 Great for the social aspect of the game or for fun and unique battles with your friends of your local gaming group? Heck yeah! Sure there are some issues here and there, and I hope GW solves that by coming out with some solid information or with a more "complete" rulebook. But the games is what, a week old or so. The community still needs to find their way and probably GW is experimenting heavily with the new rules. One more thing about the balancing btw: I talked with a bloke from my FLGS last Saturday and he said that the AoS starter kit is much more balanced then the free rules we've got for the existing armies (he played the game and the scenarios that come with the starter and he was quite enthousiastic). So I think GW just gave the old WHFB players a bone with the Warscrolls (those warscrolls contain the new rules for the units of the current model lines) and went "Here are some free rules for ya, experiment and have fun 'till we bring out the official stuff." Perhaps a bit of a slap in the face for the veterans of the game. And it may feel like a half arsed attempt to keep people playing with their old models. But hey, free rules.... I repeat, FREE rules (GW- is that you?!) and the old armies are still valid. Colour me interested! So, why not give it a shot! And that brings me to my other subject, Lizardmen! For Sigmar! Or was it the Old Ones? Wait- are they still in the fuff?! With AoS you don't need a whole lot of models to play. Just a few units and an Hero/HQ/General, -or what ever it's called these days- download the rules and you're good to go. Sounds tempting right? So, I've nudged my gaming buddies today to see if they're interested too. One of my friends has actually some Dwarves, so he was up for a few games right away. And an other one was already looking in to the factions to see what sparked his interest. Maybe I've started something- we'll see. 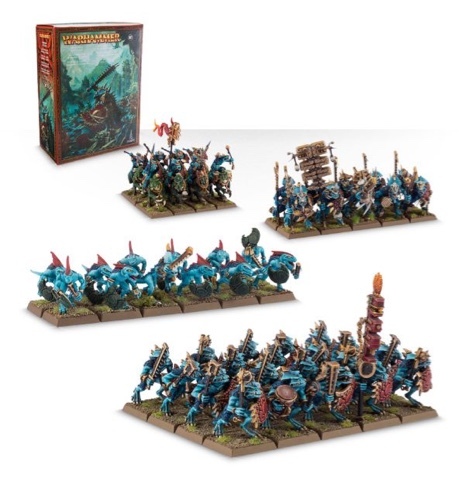 Anyways, my plan is to buy a Lizardmen Batallion kit to get some core units. 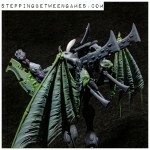 One or two characters to act as my Heroes, perhaps one big beastie or some flyer units for support. But I'll start with just the Batallion box and a Hero (and I already have one box of Temple Guard). 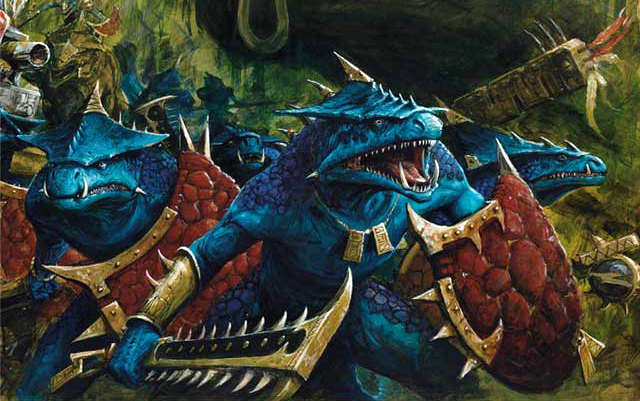 Perhaps GW releases new Lizardmen models by the time I actually start this project but we'll see what time brings. So when will this project start you ask? Not until the Skitarii are done. Simple as that. I see myself buying the kits soon but actually painting them has to wait. The Skitarii project is currently at full speed along side Waaagh! Blackheart so I don't have time for more. Will give you updates of the two soon btw! So yeah, that's my "grand" scheme for now. So all is not lost for my Lizardmen! And I hope my friends are willing to experiment and play a few games with AoS! 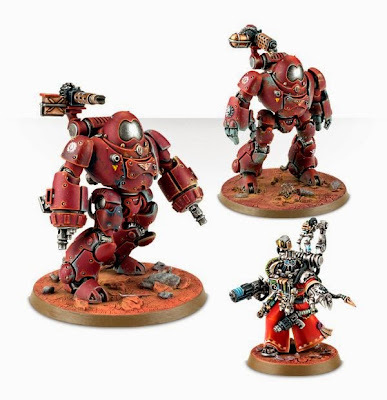 I also hope that GW will support this product and keeps releasing the good stuff and be a little bit more open about the changes and their future plans! Stay calm, sit and wait at what's to come, give it a chance, take the rumours with piles of salt, play the game, play it again, and again, and again, experiment, adjust, and if you still don't like it; then play Kings of War or Fantasy 8th edition, or heck, Oldhammer for that matter, just don't be a jerk about it. Oh. And last but not least, HAVE FUN! In terms of the game itself I am not all that fussed. I dont play WHFB and doubt i will play AoS. The only lose I see in terms of the game is the move from massed rank tactic battles to the loser skirmish style. For me its the end of the Old World that hurts, but i totally understand why they did it. I will tip a glass to the old world now and again and re read some of its amazing stories and history.